Edvice is an on-demand tutoring platform for Indian students. 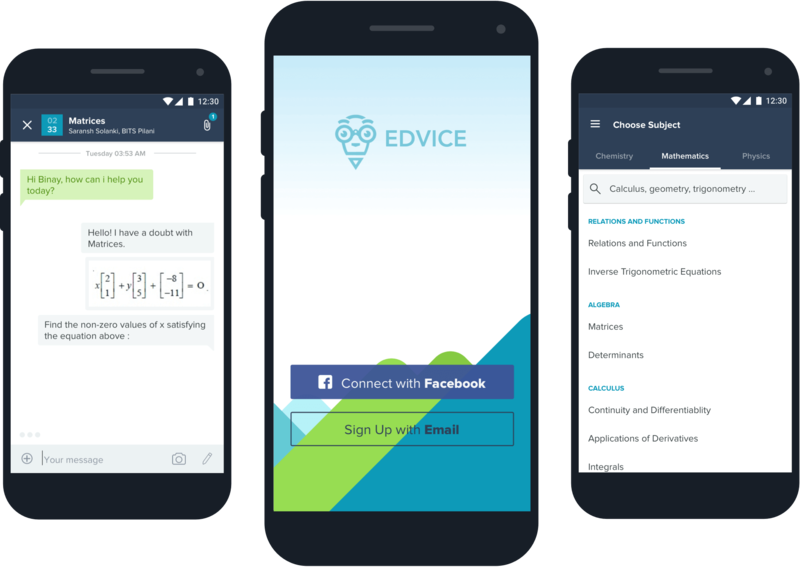 Edvice is an on-demand tutoring platform for Indian students. We noticed a genuine problem in the engineering prep system in India and wondered why tech had not solved it yet. Hence we came up with Edvice. As a co-founder of the dorm-room startup out of Pilani, I was one of 3 students who started this on-demand tutoring platform as Edulyft in 2014 that was rechristened as Edvice and is currently being used by 500 thousand+ students post its acquisition by Hashlearn. I was one of the co-founders who started the platform named Edulyft which was later rechristened as Edvice. Apart from building and designing the product, I spearheaded the marketing and hiring verticals and eventually led the company to a successful exit with the acquisition by HashLearn, an Ed-Tech organization led by veteran entrepreneurs. We noticed a genuine problem which one of our co-founder’s brother and my younger sibling were struggling with, and we realized that we had struggled with it too. We remember how, no matter how much we studied, after a point, our scores for our aspired entrance exam always plateaued. Moreover, when our siblings complained about the same thing, four years later, we wondered why tech had not solved this yet. This was our eureka moment. Our users were primarily the high school students preparing for various competitive examinations in India (IIT-JEE, BITSAT, NEET/AIPMT, etc). Some of these tests are considered to be the toughest in the entire world. Since we were based out of Pilani (a small town in Rajasthan where we did our undergraduate studies), we focused on the top-tier cities with internet penetration around Pilani (Jaipur, New Delhi, Agra). Later on, we started acquiring users from Bangalore and other cities in the south. On in-depth analysis of the problem through talking to many students and parents, we recognized a pattern. Lack of personal teacher guidance led to lack of confidence amongst students. The students had no idea whatsoever on what topics they were weak in and how to improve. They do not have teachers to contact to and hence feel helpless. Students spend 6 hours 42 minutes on self-study every day, most of which is spent on solving a doubt on which they are stuck for long. Lack of guidance is a vital problem here. On average, an engineering-prep course costs around 1.2 lacs per year with not so sure returns. With all these issues, we understood that there is a genuine necessity of an always-available tutor/companion to help students out. This was a B2B2C model which was sold as packages to coaching institutes on per student basis. We were able to get a few clients in Delhi, Jaipur and other cities nearby to Pilani. Edulyft did not scale up as expected. Most coaching institutions thought that the product did not fit their business goals. Their definition of personal attention meant personally counseling a few select toppers and ensuring their quota of a few top ranks in these examinations were fulfilled. This helped them get more repeat students the following year. People shut their doors in our face, hung up or did not even return our calls. 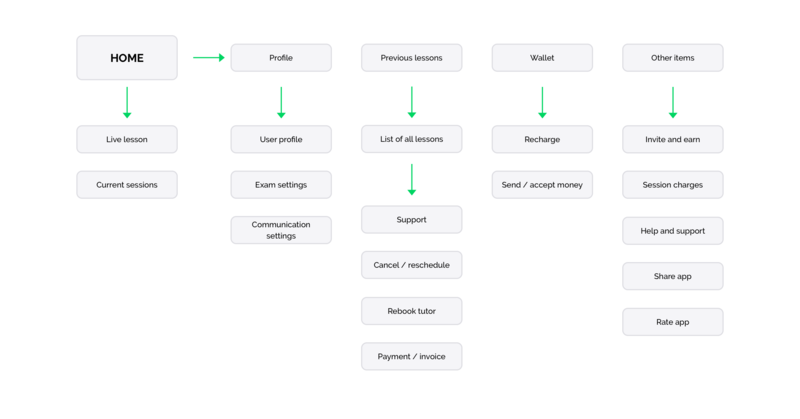 We got pragmatic and pivoted to a consumer-centric app called Edvice through which a student could get connected instantly to a tutor & clear his doubts. We wanted to crowdsource tutorship. Since the B2B solution had its own blockers, we started ideating on a B2C solution. A platform where we crowdsourced tutoring. There are thousands of students who pass these entrance examinations every year. We planned on using these as our tutor base to help out the next aspirants for such examinations. 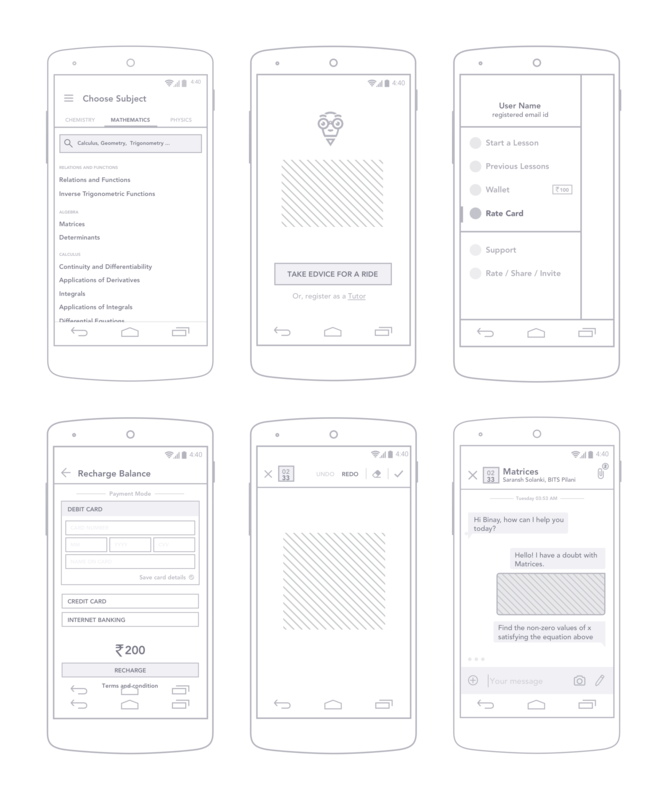 After speaking to a lot of engineering students and aspirants we realized that this could work if we built an extremely seamless way for them to communicate. We hired tutors from BITS and IITS which helped solved several doubts of students 24x7 via a chat-based-platform. 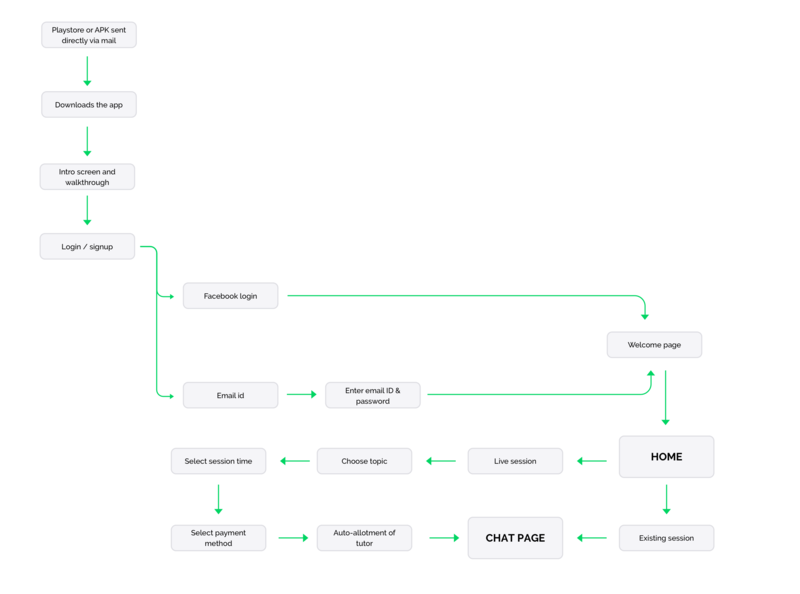 We created a nested doll pattern which leads to linear user flows. 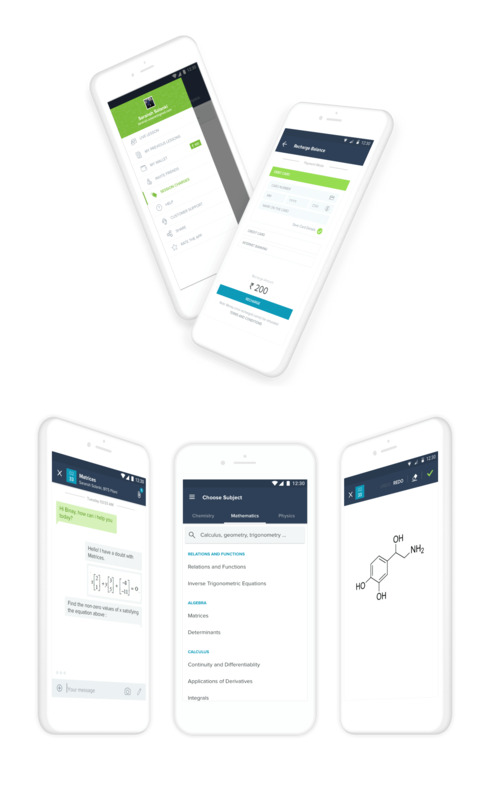 Since the main activity on the entire app was the flow to book a tutor and chat with them, we used created that as our home page. A side navigation was provided was other linear flows. Initially, we targeted students with a smart-phone but very soon we realised that our prime users actually were parents who provided the app to their children whenever they felt a need. Hence a lot of our marketing and user acquisition strategies were built to get the attention of parents. As one of our user-acquisition strategies, we created an interactive infographic showcasing the troubles on an engineering aspirant in India. This was viewed by 10k parents and students in a day. We launched the first version of Edvice in early Feb 2015. We went through a lot of brainstorming and tried to create an MVP to test out a lot of our assumptions. We raised our seed investment round during this phase and with the help of our mentors took the product to a successful exit. While a shift from B2B to B2C brought its own challenges, we survived, continued to fight and achieved a successful exit through an acquisition to Hashlearn in June 2015. We were one of the very few in 50 years of BITSian history to achieve a successful exit while at BITS. People shut their doors in our face, hung up or did not even return our calls. With literally no money and boiled eggs for dinner, we continued to fight for the product to shape. The average age of the team at the time was 21.42 years old and we were all still undergraduate students at BITS Pilani. We launched Edvice in early Feb 2015 and got acquired by Hashlearn in June 2015. The team continued to be a part of HashLearn, rebranded Edvice to HashLearn Now and today it is loved by thousands of tutors & students who use it on a daily basis.